The “Seven Sisters,” a.k.a. the “Pleiades” (plee-uh-deez) is an easily visible open cluster of stars that number, truth be told, many more than seven. The brightest seven of these stars were given names from classic Greek mythology as the daughters of Atlas and Pleione. They are, from brightest down, Alcyone, Maia, Electra, Merope, Taygeta, Asterope, and Celaeno. To the naked eye, the Pleiades appears at first as a faint fuzzy patch. With clear sky and good eyes, closer scrutiny should resolve at least the brightest four of these Sisters. Through binoculars you’ll see dozens. 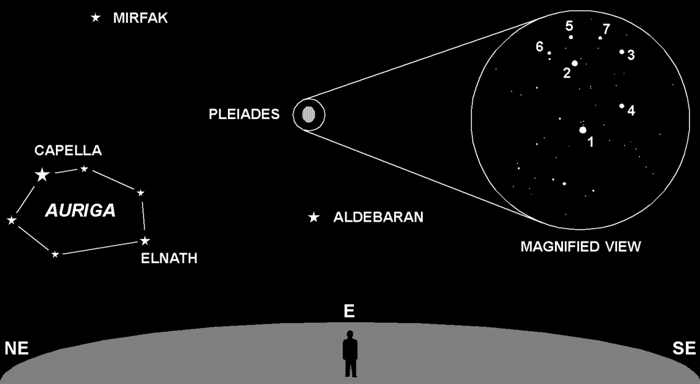 Beginning stargazers commonly mistake the Pleiades for the Little Dipper. It does indeed have a dipper shape, but the real Little Dipper is 90° away from the Pleiades, connected to the North Star, and 20 times larger. In Japanese sky lore Pleiades is known as “Subaru,” which translates into “the grouping.” Next time you’re stopped behind any Subaru in traffic, check out their logo. It features a group of six stars arranged in the correct dipper-like pattern. Why only six? The seventh Sister, Celaeno, is a faint magnitude +5.4 star. That’s very close to the +6.0 limit of naked eye visibility. Only those with excellent eyesight and clear dark skies will spot her (she’s #7 in the chart).